The boys-a dull, cold day before Dmitri’s trial. In his youth, Fyodor Pavlovich Karamazov is a coarse, vulgar man whose main concerns are making money and seducing young women. He marries twice and has three sons: Dmitri, the child of his first wife, and Ivan and Alyosha, children of his second wife. Fyodor Pavlovich never has any interest in his sons, and when their mothers die, he sends them away to be brought up by relatives and friends. In the beginning of the novel, Dmitri Karamazov, who is now a twenty-eight-year-old soldier, has just returned to Fyodor Pavlovich’s town. Fyodor Pavlovich is unhappy to see Dmitri because Dmitri has come to claim an inheritance left to him by his mother. Fyodor Pavlovich plans to keep the inheritance for himself. 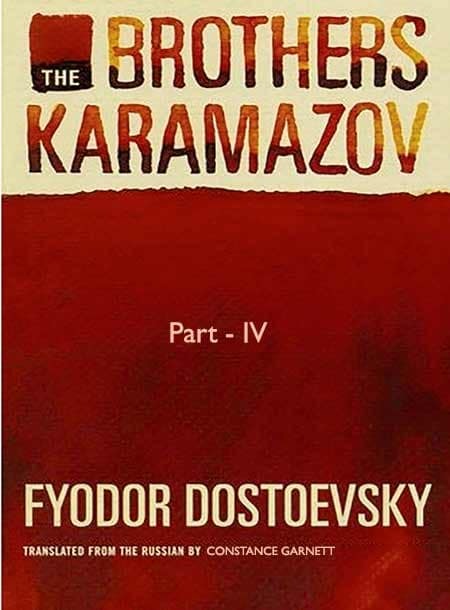 The two men swiftly fall into conflict over the money, and the coldly intellectual Ivan, who knows neither his father nor his brother well, is eventually called in to help settle their dispute. The kind, faithful Alyosha, who is about twenty, also lives in the town, where he is an acolyte, or apprentice, at the monastery, studying with the renowned elder Zosima. Eventually Dmitri and Fyodor Pavlovich agree that perhaps Zosima could help resolve the Karamazovs’ quarrel, and Alyosha tentatively consents to arrange a meeting.